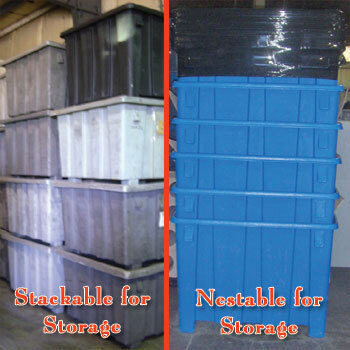 Replace cardboard, wood or less durable materials with a bulk storage container that can be used again and again. Ship, store or utilize for manufacturing purposes to safely contain practically anything. Polyethylene is suitable for a wide variety of chemicals, food ingredients, manufacturing materials or containing waste products. Rotational molding yields durable long lasting parts. 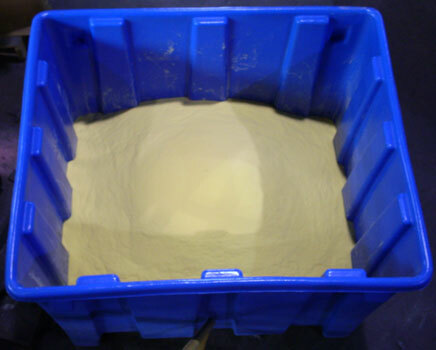 Polyethylene construction withstands higher standards than cardboard boxes or other less durable plastic containers. 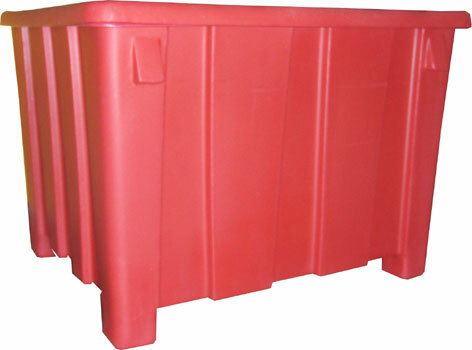 Bulk Storage Container comes complete with polyethylene lid. The design for the GP-1004 bulk storage container has a four-way forkliftable feature. Unlike other containers or cardboard boxes this unit does not need a pallet to be moved. 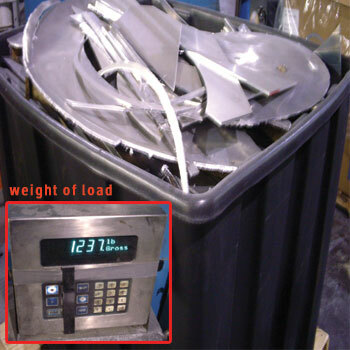 This container is able to be stacked yet easily accessed by forklift. Many colors are available standard or virtually any color is available via custom order. Granger Plastics can match colors for company branding or easy identification. In addition to colors, this container is also available in black reprocessed/recycled material as well as food grade natural material. Many configurations are available for this versatile container. Hasp locks available for secure document storage. Support rings are available to maximize the use of the container for liquid applications. Indexing accessories available in several materials. Castors also available in a number of configurations. The nearly indestructible bulk storage container by Granger Plastics, technically known as the GP-1004, is a product that virtually every company could benefit from. Many companies spend large sums of money on cardboard boxes or less durable plastic containers that cannot withstand the same stresses that a Rotationally Molded container can. Granger Plastics Company designed the GP-1004 bulk storage and shipping container for a variety of uses. Not only is it durable, it is conveniently four-way forkliftable, a design feature that many containers lack. This features allows the container to be moved and accessed more conveniently without the need for an additional pallet. There are no sharp corners making it easy to thoroughly clean. It also possesses a flat bottom surface and can be stacked and nested together for easy storage! It is available in USDA/FDA approved materials as well as in recycled materials for non-food applications and environmentally minded companies. Customizable features include a wide range of drains and fittings to adapt to a variety of needs! GP-1004 nests for shipping and storage! Bulk Storage Container also has a flat bottom! 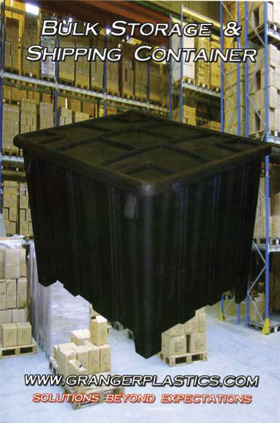 Many recycling and material handling facilities across the globe rely on Granger Plastics’ Rotationally Molded Bulk Storage Container. Some facilities require storage containers that are capable of being used with indexing attachments for forklifts and other various material handling equipment. As a large number of these recycling companies have found out, Granger Plastics manufactures a leading Rotationally Molded Bulk Storage Container with optional indexable attachments. These indexable bulk storage container attachments can be supplied in a variety of durable materials, such as aluminum or stainless steel, to fit a wide range of applications. These attachments, allow the Bulk Storage Containers to remain 2-way forkliftable, while still allowing for indexing. See the 5 Gallon Bucket Flotating? Does not deflect with 300 gallons of water in it! Save money and time by utilizing a container that is reusable, durable and can be fitted to an exact application. Contact Granger Plastics Company to discuss your exact needs and to learn more about this versatile product! Colors at no extra cost!